In this post we examine five of the best-selling picnic tables and compare their features. Picnic tables are a staple of American backyards everywhere. They're essentially modified tables with either attached or detached benches designed for allowing multiple people to sit and eat together. Most picnic tables are made of wood, but more durable materials like polyethylene and metal can be found. In addition, they come in a variety of styles and shapes (Source). Most picnic tables consist of a table and benches. 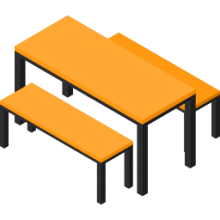 They can be benches that are attached or separate from the table. People use these by sitting down as a group and enjoying a meal and each other's company. They can be found in parks and in most people's back yards. One thing that's important to buyers is how much weight a picnic table will hold. While looks are also important, knowing that there won't be a 'disaster' during dinner is critical. Another thing people consider is whether the table will be stored or left out. If it's to be stored for the winter, the ease of tearing down is something worth considering- both Lifetime tables and the Best Choice tables fold up, for example. Lastly, materials play a big role in buying decisions. Wood is popular and beautiful, but left untreated, can wear out over time. Materials like polyethylene don't look as good, but can last for decades (Source). Perhaps the most unique among the picnic tables we looked at is the Hopkins (90182oNLMI) 2x4 picnic table frame, which is only the metal frame to which you add your own 2x4s. This design offers great value for the price and gives you more options when it comes to the type of wood and color you get. However, some buyers said the kit didn't come with enough screws to ensure assembly. 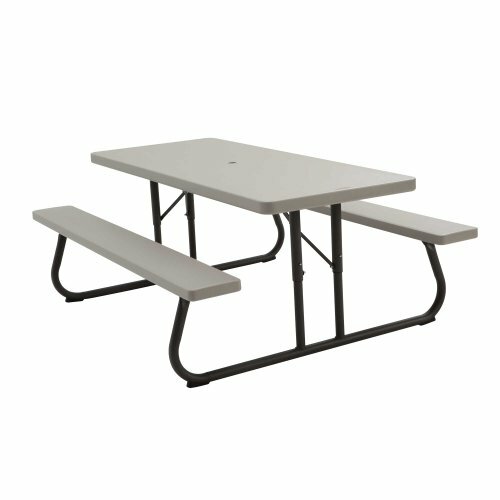 We also looked at two polyethylene tables -- the Lifetime 60030 picnic table and the Lifetime 22119 folding picnic table. Both are 6ft. and constructed of high density polyethylene, which offers strength and durability. Both are easy to set up and take down. Of the two, the 60030 is a bit more sturdy with its low allow steel frame. Buyers noted that sometimes these tables arrived poorly packaged (Source). We then looked at two wood picnic tables -- the Best Choice Portable 3 piece folding table with wooden tabletop and the Best Choice Outdoor 6 Person Natural Finish Wood Picnic Table. Both offered attractive designs that would complement any back yard and customers noted the outstanding customer support offered by the company. The 3 piece table is lightweight, folds easily for storage, but may not hold up for many seasons. The 6 person table got high notes for its round design, natural finish and ease of assembly, but some complained that it was too small and made accommodating larger people difficult. The Lifetime Folding Picnic Table could be a solid option if you want a strong and sturdy picnic table. Users like the functionality of this picnic table, but some do complain about item arriving damaged. This product is a picnic table set that comfortably seats up to 8 people. Both the table and the attached benches are made of high-density polyethylene for superior strength and durability. The item features UV-inhibitors that protect against fading and cracking. You can fold it flat for easy storage and transportation and you can choose between hunter green, putty and white granite color. This item might be a good choice if you’re looking for a lightweight picnic table which would be convenient for home use. In general, buyers have a favorable opinion of the Lifetime Picnic Table. They agree that it sturdy, easy to set up and easy to put away. However, some buyers complain of receiving a damaged item. Some complain that the leg was scratched, others that the table had several dents and some share that the table arrived with a cracked top. The Best Choice Products 6 Person Picnic Table Set is a solid option if you want to provide extra seating for your backyard. Users like the quality of this picnic table, but some complain about its size. 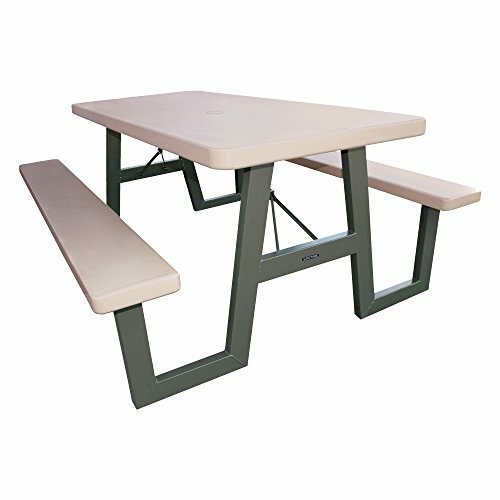 This product is around picnic table with 3 benches that seats up to 6 people with a maximum capacity of 500 lbs. The set is made of weather-resistant and durable wood with a natural finish. This outback-style picnic table features an umbrella hole in the middle of the table adding shade during sunny days. This item could be a solid choice if you want an outdoor furniture to complete your outdoor living or recreational area. 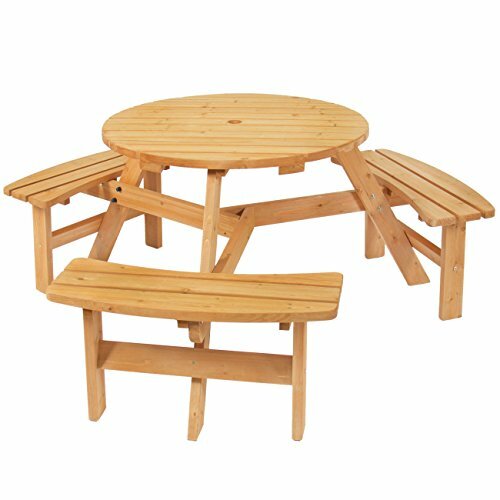 In general, users state that the Best Choice Products Outdoor Wood Picnic Table Set Natural Finish meet their expectations. They agree that it is made of high-quality materials and that it is easy to assemble. However, some complain that the table is small for 6 adults to sit comfortably. One buyer warns that the wood is soft, so you need to be careful not to scratch it. A dissatisfied user found it too hard to put the set together. If you’re looking for a top-rated picnic table, you might want to consider the picnic table kit offered by 2×4 Basics. Users like the table length control that they have with this kit, but some do complain about stability issues. This product is a kit that includes the frames to make a picnic table and two benches. The assembly is simple and requires only a powered screwdriver, wrench and a saw. With this DIY kit, you can make a sturdy picnic table up to 8 feet long that you can stain, paint, or finish the wood to fit your style and application. This item might be a good choice if you are looking fora kit that will help you dream picnic table come true. With this product, you can make a sturdy picnic table up to 8 feet long that you can stain, paint, or finish the wood to fit your style and application. This item might be a good choice if you are looking fora kit that will help you dream picnic table come true. The general user consensus concerning the 2×4 Basics Hopkins Picnic Table Kit is that it is a great kit for making the picnic table of your desired length. Many buyers state that it is easy to make it with clear instructions that come with the set – all you need is a power drill with a screwdriver attachment. However, some buyers complain of running into stability issues with building a8′ table. As they state, at this length both the benches and the table wobble. Another issue some users ran into was getting the boards for the table and bench to align with the grooves for the screws. If you are looking for a picnic table, you might want to consider the Best Choice Products 3 Piece Folding Picnic Table Set. Users like the construction of this picnic table, and so far have only minor complaints. This product is a folding bench set that is made with a sturdy and reliable iron frame, as well as with smooth fir wood boards that will remain intact for years to come. It features a folding design that allows for quick and easy storage and transportation. This product might be a solid choice for an outdoor rest with a snack or beverage. This recreation table might be a solid choice for an outdoor rest with a snack or beverage. In general, users have a good opinion of the Best Choice Products Wooden Table top Picnic Table and they conclude that it has a nice construction and that, all in all, it is a decent product for the price. One satisfied buyer shares that the item is finished so you don’t need to waterproof it. The only complaint so far is that the bench slightly dips when you sit hard on it. The Lifetime W-Frame Folding Picnic Table might be a solid option if you want an all-weather, rust-resistant model. Users like its sturdiness, but many do complain about poor packaging and missing parts. 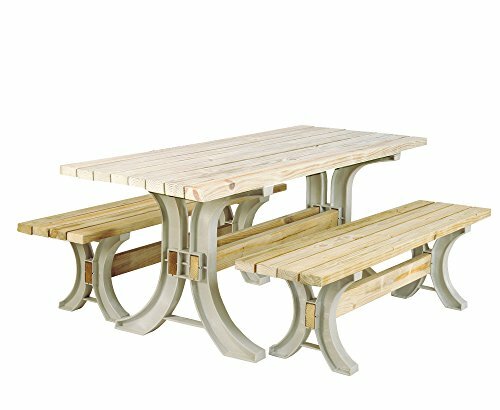 This product is a completely waterproof picnic table set that seats 6 to 8 people comfortably. It has a unique folding design that makes it convenient to store and transport. The set is made of high-density polyethylene with UV-inhibitors and is stain resistant. If you want a picnic table that can endure heavy rain without chipping, cracking, peeling, or rusting, this item might be a solid option. In general, users state that the Lifetime 6 Feet Picnic Table is sturdy and stable. They agree that it is easy to assemble, store and transport. However, there are many buyers who complained about terrible packaging conditions. They state that the box arrived ripped, torn and re-taped several times, while the hardware required for the assembly as well as the instructions were missing. When it comes to selecting the best picnic table for your backyard there are several considerations you should keep in mind, according to Mr.handyman.com. Indeed, during the warmer spring and summer months, you'll likely be entertaining family friends and neighbors with backyard barbecues and summer birthday parties- a spacious and comfortable picnic table is a great solution for entertaining and feeding your guests. Or you're on the waterfront prepping your inflatable boat for a lake cruise! There are a bunch of different styles available including a kid's picnic table, lifetime table, picnic tables made from wood as well as durable plastic materials, and even DIY tables that you can purchase plans to create. One of the most important factors is the outdoor seating capacity. You want to figure out how many guests you will be entertaining throughout the warmer months- this will help you figure out whether you need a small, medium, large or even multiple tables to accommodate your backyard social functions. Another important consideration is portability. Depending on where you live you may want to store your table during the winter months to protect it from weather damage. You can buy a folding picnic table with lightweight legs that compactly holds up to conveniently store in your basement. You also want to consider the material your table is made from. There are two primary materials- it'll either be constructed from metal, which means it will be aluminum or steel, or it will be made in a more classic way from wood. The advantage of purchasing a metal table is that they tend to be more durable, better resist extreme outdoor temperatures and prolonged exposure to sunlight. On the downside, they often lack the aesthetic appeal of a classic wooden table. Indeed, many buyers prefer buying a Cedar table because they love the rustic, camp-like feel of the outdoor furniture. If you're a woodworker or just especially handy with tools you can build your own picnic table from DIY plans on the Internet. Many woodworkers look through Pinterest images to gather inspiration for the designs they ultimately construct. Another interesting article we examined comes from xpblocker.com. They write about vandal resistance-meaning that the picnic tables they're talking about are installed in public parks where it's important that the materials will withstand the aggression from local hooligans. One thing they recommend is purchasing recycled plastic tables that come with lengthy warranties to in sure that weather, insects, and vandalism will not permanently incapacitate the tables. Fiberglass tables are also a recommended option especially for children because they are heat resistant and lightweight, meaning you can move them around in the sun won't scorch them to a temperature dangerous for kids. Another interesting consideration that we hadn't even thought about is ADA compliance. Tables with extra leg room can accommodate disabled individuals because they have less foot area obstruction. If you're buying an ADA compliant picnic table, you should conduct an ADA compliance audit so that you are fully apprised of the specific requirements in your local community for these disadvantaged people's. 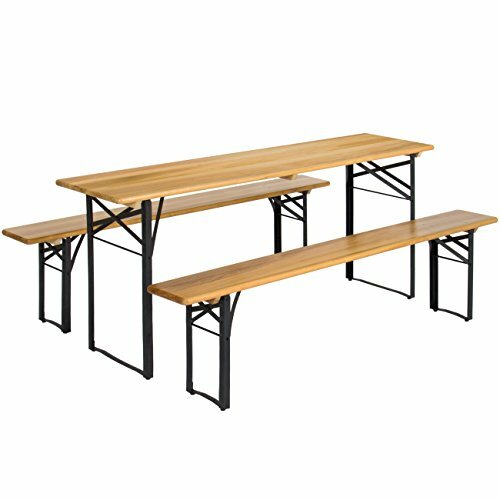 Over at Parktables.com they say that a common misconception is that purchasing a table that has sufficient wheelchair clearance height is enough to satisfy ADA compliance, but there are other considerations like knee and leg clearance, toe clearance as well as firm ground space stability. Smaller round-shaped picnic tables are a great collaborative area for outdoor enthusiasts who want to share private conversations. You also want to consider purchasing a table with a hole in the center for erecting an umbrella, especially if there is no shade in the picnic area. Overall, as we have seen, there are a variety of different styles of picnic tables available, and it's important to distinguish between private and public buyers because if you are purchasing a picnic table for public use there are more legal requirements that you'll have to observe.